Decorating your outdoor space with a cohesive design can turn it into an outdoor room and a throw pillows are the best way to start! 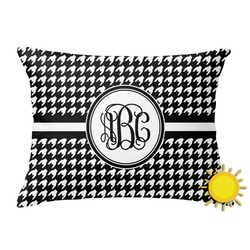 Add a throw pillow to your outdoor seating and you instantly add comfort and color. 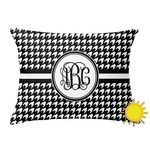 Our outdoor throw pillows are available in two shapes - rectangular (1 size) and square (4 sizes). We like the concept of a 2 in 1 pillow, so the front and back of the pillow are designed individually and can have two different designs, or exactly the same design - the choice is yours. Our starting point designs have coordinating backs for the 2 in 1 pillow concept; but can be easily changed to be identical. Our outdoor pillows are printed and sewn right in the USA. Each pillow cover has a hidden zipper, so that the pillow insert can be easily removed. Pillowcases are made from durable, soft, stain resistant woven polyester (see close up shot) and are machine wash & tumble dry on low. You pillow also includes a pillow insert that is also made in the USA and is stuffed with polyester fiber. To provide you with some ideas, we have created 100's of different designs. You can browse these and use one of them as your starting point. You can them customize it with our system to change the colors, ribbons, labels, graphics and change or delete the personalization. If you have something specific in mind, then design it yourself. We offer you 1000's of pattern and graphic to assist your design. You can also upload photos & you own design if you so desire. i customized these outdoor pillows for my sons boat. Very surprised how durable they are. He loves them! I love it! It's high quality, the printing of my design on the fabric is high resolution and not blurry at all. It's 100% perfect. Thank you!